This artist's impression of a gamma-ray burst shows the two intense beams of relativistic matter emitted by the black hole. To be visible from Earth, the beams must be pointing directly towards us. Gamma-ray bursts, the brightest flashes in the universe, may give off an afterglow full of light waves that move in corkscrew-shaped spirals, sort of like the filtered light that makes watching 3D movies possible, scientists say. The discovery, unveiled Wednesday (April 30) in the journal Nature, contradicts what theoretical models have always predicted about so-called circularly polarized light in gamma-ray bursts and has at least one scientist completely "gobsmacked." A "big bundle" might be an understatement. Gamma-ray bursts are intensely bright flashes that may last for just a fraction of a second but give off more energy than our sun will radiate in its entire lifetime. These bursts occur when a massive dying star collapses into a jet-spewing black hole. This super-fast jet creates a shockwave, which is believed to generate an afterglow. Scientists thought just a small fraction of that light would be circularly polarized. 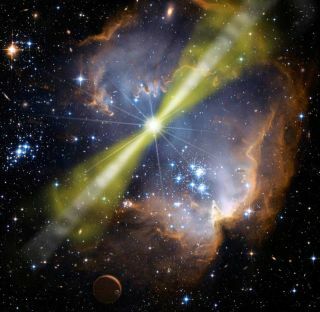 Scientists observed circularly polarized light from gamma-ray burst 121024A, as seen on the day of burst by the European Southern Observatory's Very Large Telescope (VLT) in Chile. Only a week later the source had faded completely. Polarized light travels in a uniform way, bouncing up and down or left and right, but in the case of circular polarization, the light waves corkscrew around in a spiral motion, Wiersema said. 3D movies give the illusion of depth by feeding a different image to each eye through circularly polarized glasses, another study researcher Peter Curran, of the International Centre for Radio Astronomy Research (ICRAR), explained in a statement. Using data from the European Southern Observatory's Very Large Telescope, or VLT, in Chile, the researchers analyzed the afterglow from a gamma-ray burst that occurred 10 billion years ago, but was so far away that its signal first reached the Earth on Oct. 24, 2012. The scientists found that the proportion of circularly polarized light was hundreds of times greater than expected. "We were gobsmacked by this high level of circular polarization," Wiersema told Space.com. Because scientists see the radiation of so many electrons in the afterglow of gamma-ray bursts — each moving in slightly different directions, all summed together — scientists assumed the circular polarization of the light should be washed out. The new discovery suggests there could be some sort of order in the way the electrons move. "This is a quite fun, as it has always been very difficult to study these electron acceleration processes in a laboratory or computer simulation — it seems Mother Nature provides us with a great laboratory," Wiersema said. The team is eager to figure out whether this particular afterglow was simply an oddball or if all gamma-ray bursts have a lingering light that behaves this way, Wiersema added.